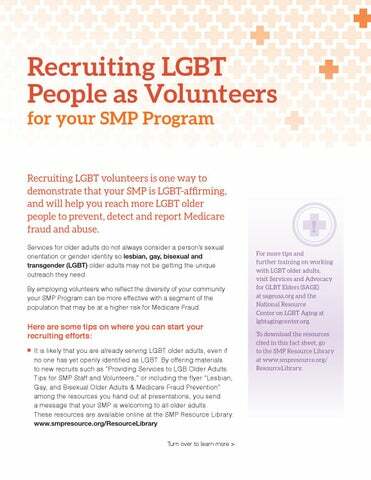 Recruiting LGBT People as Volunteers for your SMP Program Recruiting LGBT volunteers is one way to demonstrate that your SMP is LGBT-affirming, and will help you reach more LGBT older people to prevent, detect and report Medicare fraud and abuse. Services for older adults do not always consider a person’s sexual orientation or gender identity so lesbian, gay, bisexual and transgender (LGBT) older adults may not be getting the unique outreach they need. By employing volunteers who reflect the diversity of your community your SMP Program can be more effective with a segment of the population that may be at a higher risk for Medicare Fraud.
! 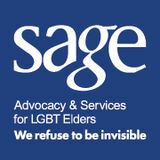 For more tips and further training on working with LGBT older adults, visit Services and Advocacy for GLBT Elders (SAGE) at sageusa.org and the National Resource Center on LGBT Aging at lgbtagingcenter.org. To download the resources cited in this fact sheet, go to the SMP Resource Library at www.smpresource.org/ ResourceLibrary.  artner with local chapters of national organizations that serve P LGBT older people. A good place to start is SAGENet, a network of local affiliates around the country coordinated by Services and Advocacy for GLBT Elders. Visit sageusa.org/sagenet to see if there’s an affiliate in your area. Another organization with local chapters is OLOC (Old Lesbians Organizing for Change); go to oloc.org to view their Chapter/Group Contact List.  onnect to other local and national groups that serve LGBT people C in your community. To search for national organizations, or local groups by state, go to lgbtagingcenter.org and click on the Local Resources tab.  onsider advertising your presentations and programs in your C local LGBT community’s newspaper. A quick search online should be enough to identify LGBT news outlets in your area.